I have been quietly collecting all "Pre-RKE" and Edmund RKE variants I could find. 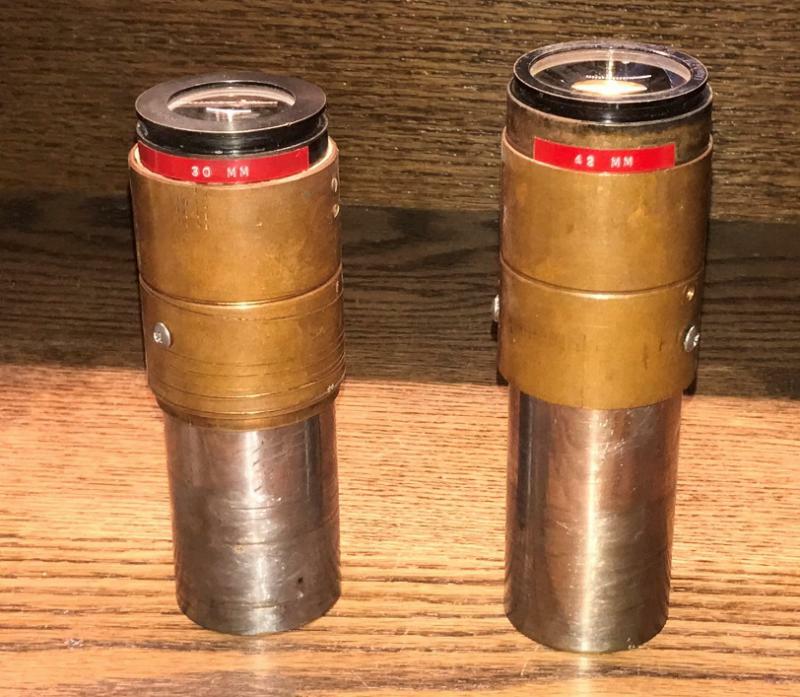 There are quite a few similarities from the Sherman Tank M-70 gun sight war surplus eyepieces on the right to the modern RKE's on the Left... 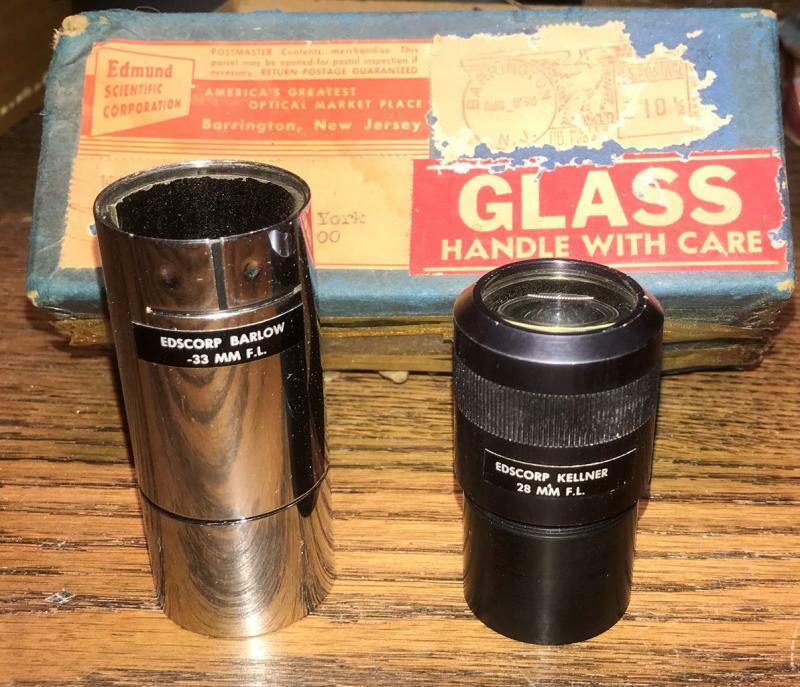 The Edscorp Kellner, as well as a few other post WWII surplus lens marketers, would sell this eyepiece as a Type III Kellner or as we call them today, a Plossl. 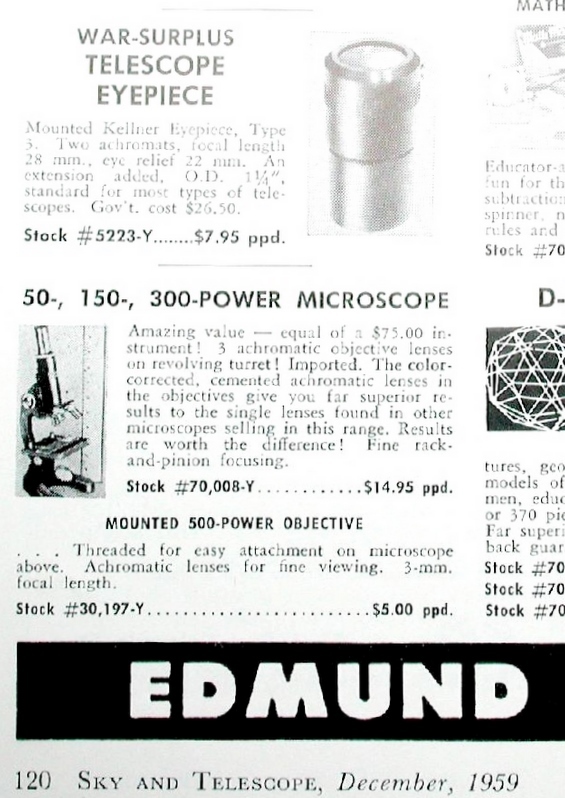 I have done quite a bit of research on this particular eyepiece and it's evolution. 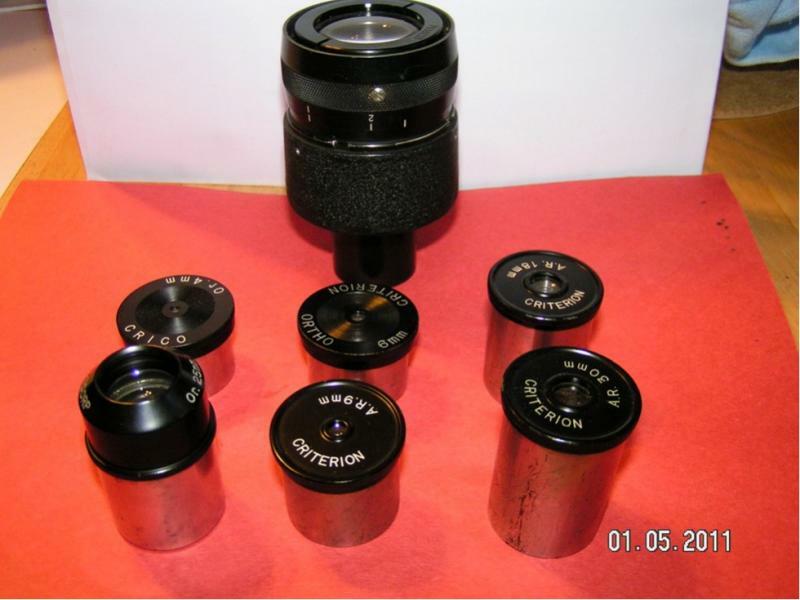 EDIT: If anyone out there is reading this and they have a similar eyepiece that look like that it could fit into this "family tree" please contact me via PM. These came with my 1959 dynascope scope. The wwII tank erfle I use maybe once a year for nostalgia. This 70 deg. ep provides surprisingly darker views than my 31N from suburban skies. At first I thought there was a coating issue reducing throughput but I can see the same faintest stars and nebula extensions are a smidgeon better in this one. I'm looking forward to a dark sky site. I did a detail measure when I took my 1-1/8" apart. The silvered barrel on the black 1-1/8" pictured did not come that way, I took the anodization off the barrel. Edited by BillP, 08 March 2018 - 12:22 PM. 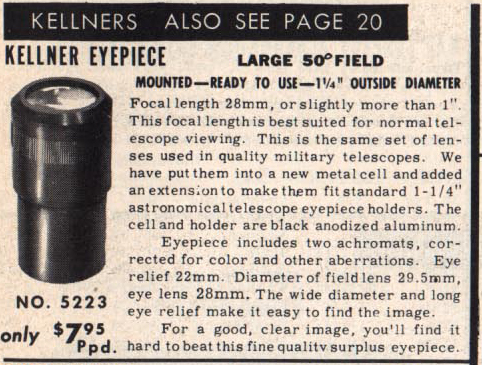 I bought one of those decades ago, and it was great in my f/15 refractor. I remembered how great it was and bought another in 2005. Ooh. My nostalgia overcame my good sense. It was not well corrected at f/5 or f/6.5, though it was OK in my f/12.7 Mak. I really liked it back then, though. I think I paid something like $12.95 or $18.95 new--I don't remember exactly. I think the RKE was an improvement. I bought one of those decades ago... I remembered how great it was and bought another in 2005. Ooh. My nostalgia overcame my good sense. My good sense is to not get instruments faster than f/6 I have 3 28 RKEs and 2 of the 1-1/8" ones. Why? Because wanted to make sure I was not left with none if I broke or lost one. Love these eyepieces! From a friend I observed with long ago. No, I mean who makes it? I've never seen one like that before. 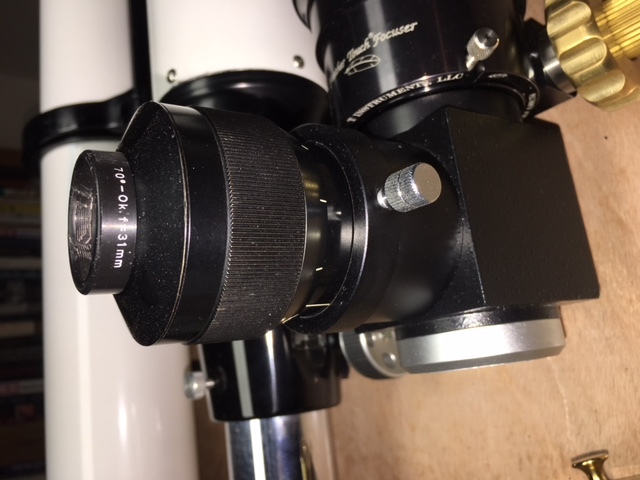 LEITZ, it is right on the side of the eyepiece... Who began making microscopes, then became LEItz CAmera or Leica. You mean maybe from an ad similar to this (Edmunds Catalog Number 5223)... I do think prices increased with inflation. My apologies. Looks like they answered that. Well, I bought my first one in 1965, so perhaps it was $12.95 by then. Kellner introduced the 2:1 3 element design in 1849. Plössl introduced the 2:2 design in 1860. König re-designed the 2:2 design for better edge correction in 1938 (the version sold by Clavé). Brandon flipped the design for good correction in 1942. Nagler made a modest change to the design in the '70s. The '70s also saw the introduction of the 5-element Plössl modification, which became popular in the '80s and continues with slight variations to this day. The Kellner II was a 1:2 design similar to the later RKE (Rank/Kaspereit/Erfle) design of David Rank. 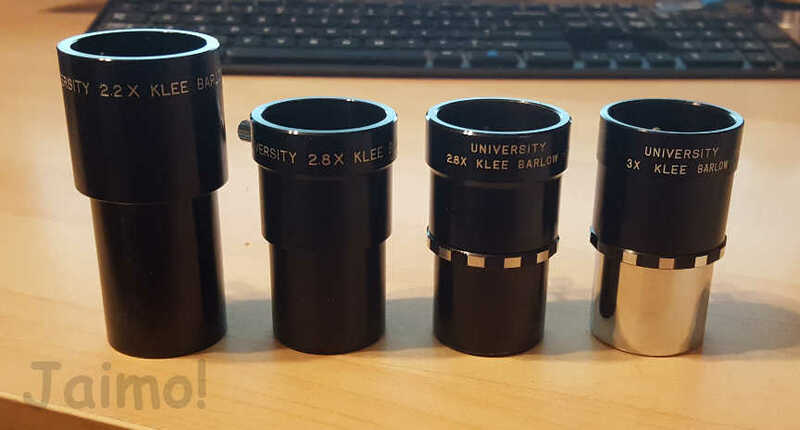 (which explains the RKE = Rank Kellner Eyepiece meaning of RKE). Whose design their Kellner III was closest to, I don't know. 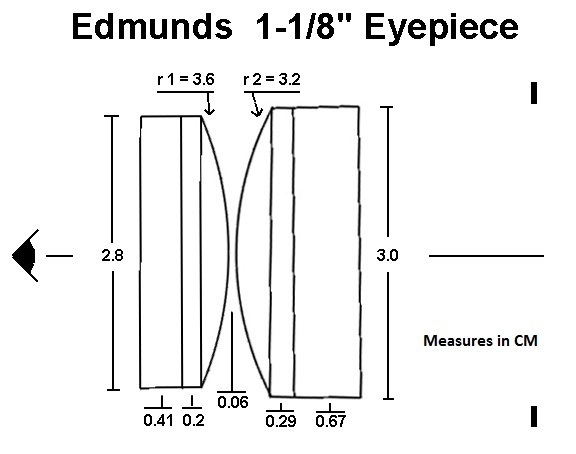 I have the 1-1/8" eyepiece that I purchased from Edmund in 1967. 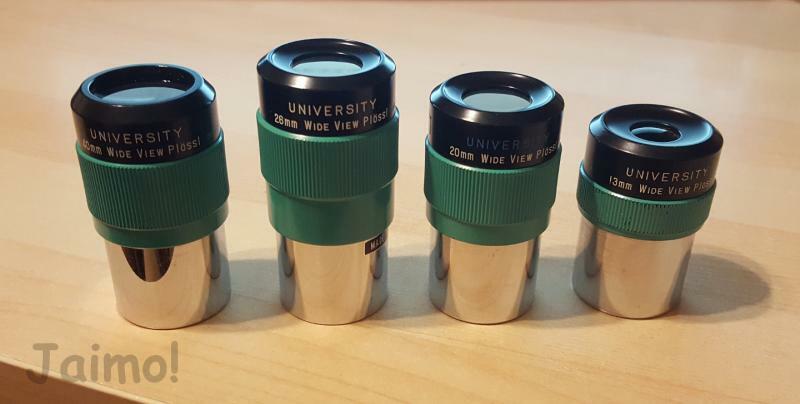 It was $7.95 at that time and is still one of my favorite eyepieces. Here is an Edmund 28mm Kellner (#5223-Y) and Barlow (#30,200-Y), with original packaging from 1958. 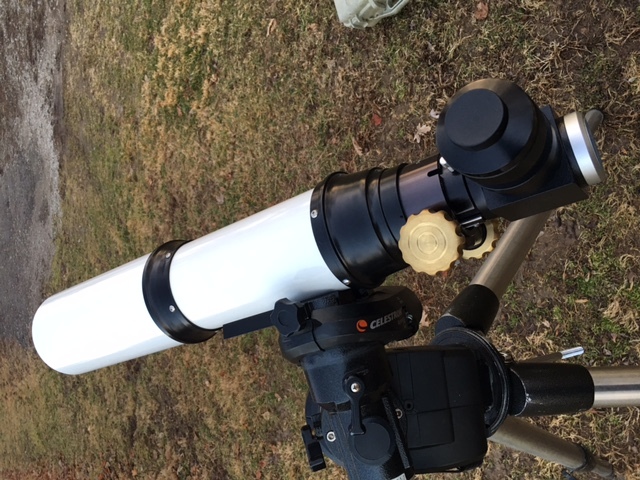 The eyepiece does not have anything on the barrel. For reference my 28mm I ordered in 1967 had the 1-1/8 engraved on the top of the barrel. You don't see these everyday. Here is a pair of war surplus eyepieces, along with their original advertisements. Here's a set I have been working on for years, just because they look cool... I believe there is a 17mm and maybe another. A bit late I realise but only just stumbled across this thread on the RKE. RKE is a design similar to one of Albert König's & it does look like a Kellner design flipped. Something to ray-trace on cloudy nights. I have to confess to not knowing "Rank-Kaspereit-Erflé" was a 1979 registered trademark. During all my delvings into the arcana of eyepieces this nugget illuded me. 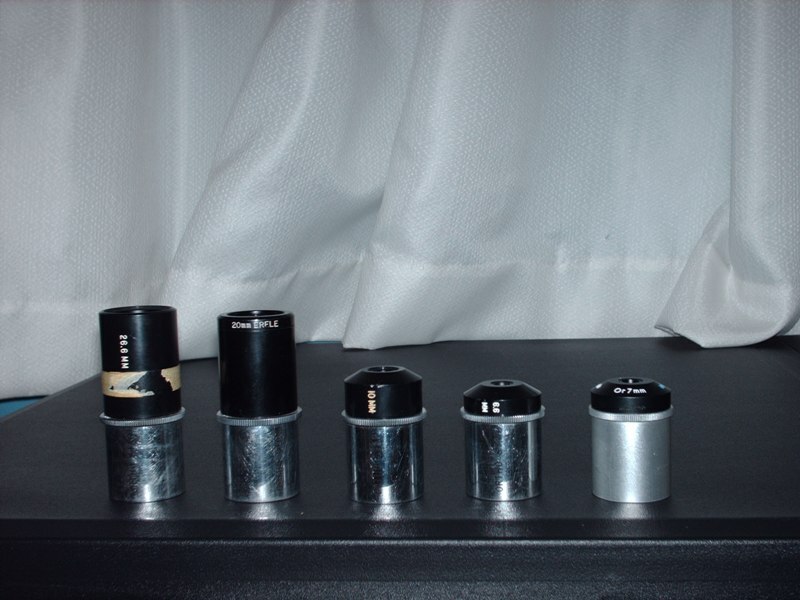 BUT it bears no resemblance to the 2-2-2 & the 1-2-2-2 aspheric Kaspereit eyepieces in my collection. Nor does it resemble an Erflé type. The RKE looks like a flipped Triplane Orthoscopic, which was sold by Circle T in Britain in the 1960's in 0".965 fit. Hi Chris! Long time. Nice to see you posting here again. And yes, exactly why David Rank felt his design stood on the works of Kaspereit and Erfle is lost to history since only mentioned (that I could find) in the patent application correspondence. I corresponded with Edmund Marketing and Technical departments as well and neither knew exactly. - corrected Erflé to Erfle. Edited by BillP, 20 November 2018 - 03:17 PM. Don, good to hear from you. Ah flu. This history lesson and photos of old EPs has been a lot of fun to read. It's been a while... and I liked this thread. Here is my collection of Klee's, kind of an "Odd Ball". Some oldies, but goodies...Not really rare, but getting there.